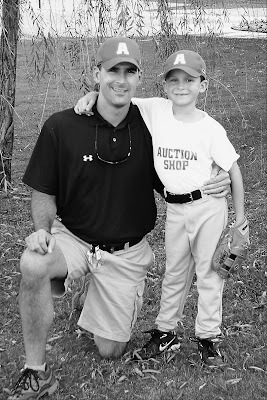 This is one of my favorite pictures of "my guys"--my husband and son. My husband and I celebrated our 13th Wedding Anniversary yesterday! It is been a joy and blessing to have this man life. We have been through wonderful times and times of challenge and struggle, but through it all the Lord has blessed and refined us. I believe that it is only in the past few years that I have come to understand more clearly God's purpose and design for marriage. It is for His glory--we just get to be used and blessed through it. 1. He loves the Lord and seeks to put Him first in everything. He did this from the moment we started dating 17 years ago. 2. He is a gentleman. He was trained with "old school" manners, which is severely lacking these days in our society. 3. He is my best friend. We talk about everything. 4. He is passionate about missions. He was saved on a mission trip in college before we met that he went on "just for the fun" of a new experience. Since then, he has led trips to Honduras, Brazil, inner-city Memphis, Nicaragua, and Kenya. 5. His willingness to submit to the Lord's leading. When we met, he was a Biology major planning on going to dental school. During his senior year, the Lord called him to seminary. Many people thought he was crazy. We were obedient and he is now a minister and knows he is where the Lord wants him. 6. His commitment to me and our family. 7. He is a great dad and really works at it, takes the responsibility seriously. He adores our kids and spends lots of time with them. They know their dad loves them! 8. He cooks and bakes--homemade bread (not with a machine) and soups are his specialty. 9. He is very "handy." We are remodeling a house we bought, and he is doing virtually everything. He has a knack for it, and I love how he just learns as he goes with new projects. 10. I LOVE his laugh. During movies, I get more tickled at him laughing than at the joke. 11. He is 6'5". For someone who is 5'10", this is great--I can wear heels! 12. I trust him completely. Happy Anniversary Sweetheart! I am still head over heels in love!